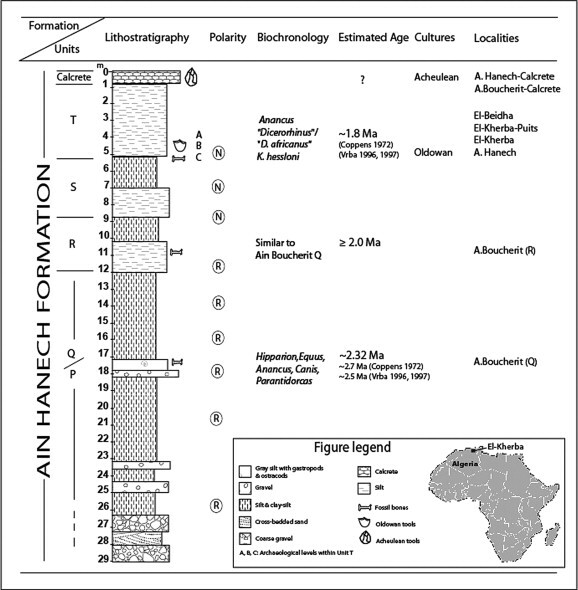 The current archaeological data on early hominin subsistence activities in Africa are derived chiefly from Sub-Saharan Plio-Pleistocene sites. 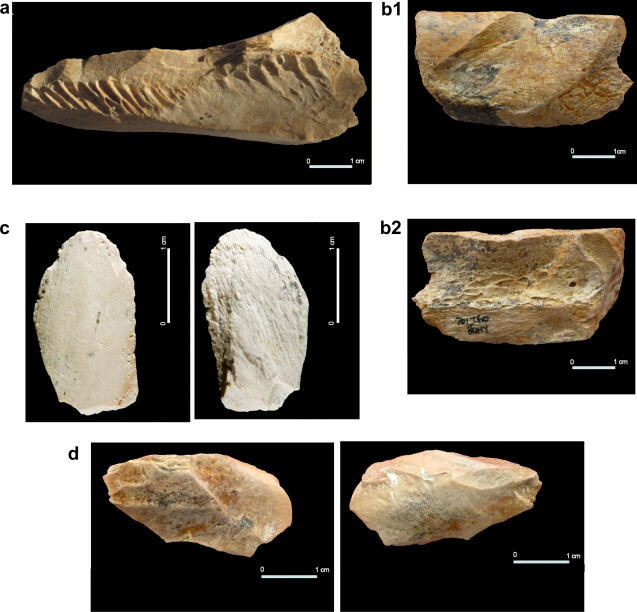 The recent studies at El-Kherba (Ain Hanech) in northeastern Algeria expand the geographic range of evidence of hominin subsistence patterns to include the earliest known archaeological sites documented in North Africa. Dated to 1.78 million years ago (Ma), excavations from El-Kherba yielded an Oldowan industry associated with a savanna-like fauna contained in floodplain deposits. The faunal assemblage is dominated by large and medium-sized animals (mainly adults), especially equids, which are represented by at least 11 individuals. The mammalian archaeofauna preserves numerous cut-marked and hammerstone-percussed bones. Made of primarily limestone and flint, the stone assemblage consists of core forms, débitage, and retouched pieces. Evidence of usewear traces is found on several of the flint artifacts, indicating meat processing by early hominins. Overall, our subsistence analysis indicates that early hominins were largely responsible for bone modification at the site, which is also corroborated by other relevant taphonomic evidence. 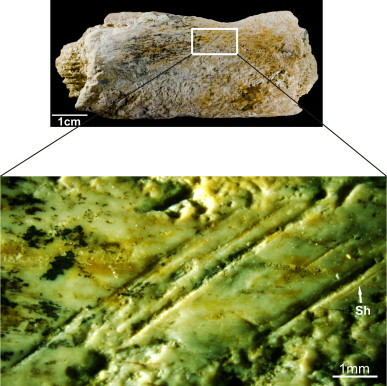 Moreover, at 1.78 Ma, the cutmarked bones recovered from El-Kherba represent the earliest known evidence for ancestral hominin butchery activities and large animal foraging capabilities in northern Africa. Figure 1. Stratigraphic position of El-Kherba relative to the Ain Hanech Formation. Both the Ain Hanech and El-Kherba localities with Oldowan stone tools are contained in Unit T with an estimated age of 1.78 Ma. Figure 6. A series of four cut marks on a hippo rib fragment. Notice the presence of a shoulder effect stria (Sh) parallel to the groove on the right. The location of the marks on the interior side of the rib fragment suggests the removal by hominins of the upper viscera. Figure 12. Examples of hammerstone broken bones, including: a) a fractured humerus bone with clear conchoidal scars; b) impact flake including (b1) dorsal face bearing a scar of a previous detached flake and (b2) ventral face with a prominent bulb of percussion. Notice the platform from which both flakes were struck; c) impact flake comprising both the dorsal and ventral faces; and d) impact flake including dorsal face with detached conchoidal scars and ventral face characterized by a prominent bulb of percussion and a ripple mark toward the end of the flake.